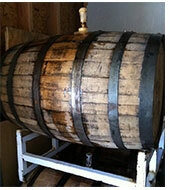 Cellarmaker, serving barrel-aged brews in SoMa. 2013. The year of beer. With a new brewery or beer garden opening on the hour — seriously, Oakland, we’re losing count — and terms like “beer sommelier” flying around, it’s been tough distinguishing signal from noise. In defense of signal: Cellarmaker, now open in SoMa and pouring pints of one-off, whiskey-barrel-aged cask ales. Cellarmaker is what happens when beer wonks set out to make the beers they want to drink — and they’ll seldom repeat themselves. 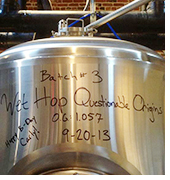 The whole production is limited to four fermenters (meaning: four brews at a time), each good for about fifty gallons. Then they age the yield in barrels that began their lives in wineries and rickhouses, lending character to CM’s already sui generis brews. Up for grabs this week in their newly opened, standing-table-strewn tasting room: a bright and fruity number called Hop Slangin’, a chocolatey porter, a light sour and a fall-friendly variety of that same sour called Peach Nightmare. What they all have in common is they won’t last long, and you won’t taste them again. Nota bene: Food here is BYO. Order delivery from the bar or snag something from whichever food truck happens to be sharking out front the day you come.